Lotung (Agenzia Fides) - Every year on November 16, the Camillians in the world celebrate with solemnity the feast of "Our Lady of Health", invoked as the patroness of the sick. "The teachings that St. Camillus left us is to assist the sick as a mother assists her sick child. The characteristic of motherhood in the spirituality of St. Camillus occupies a prominent place", writes to Agenzia Fides Fr. Giuseppe Didone, MI, a missionary in Lotung, in the Pescadores Islands (or Penghu), an archipelago between Taiwan and China. 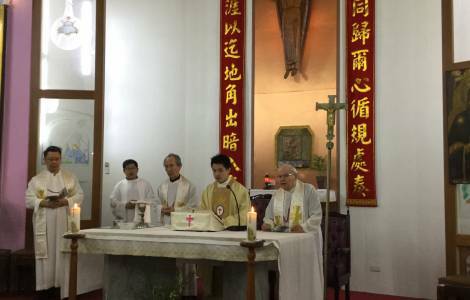 Since 1952, when the Camillians who worked in China were expelled, and a group of them arrived in Taiwan to "Look after and Evangelize", according to their motto, the devotion to Our Lady of Health has increased among the local population, composed mainly of fishermen, together with that towards St. Camillus. "This is why the first Camillian hospital, inaugurated in Lotung in July 1952, did not take the name of St. Camillus, but that of Santa Maria - emphasizes Fr. Didone -, and in the small church of the hospital a copy of the original painting, which is in Rome, is venerated". A few years later, Father Antonio Crotti built a church dedicated to Our lady of Health, which at that time was one of the five "beauties par excellence" of the Pescadores islands.